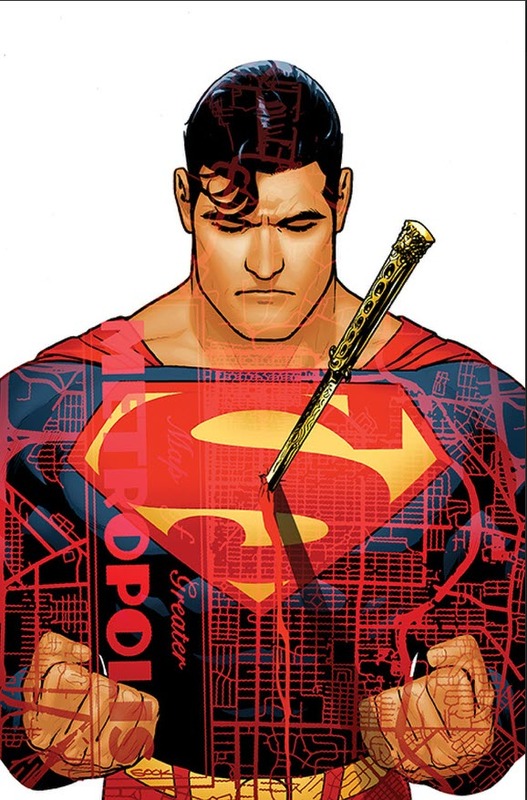 There is no complaining about the art that Bendis has lined up for these books. Sook and Epting? Impressive. Now then, we finally hear about the reveal of who is the leader of the Invisible Mafia. That last line for #1006 makes me nervous. Please please please do not make the leader turn out to be Lana Lang. PLEASE!! And as a junkie of wonky Bronze Age villains, the idea of an updated Kobra Cult makes me smile. It sounds like a Jimmy spotlight issue and I like that too. Finally the return of Jon. Hooray! The return of Mr. Oz, Jor-El. Boooo! I keep hoping that some magical Doomday Clock will erase the evil Jor-El nonsense. Make him a robot! Do something! I am not a fan of making Jon older and edgier. So I can only hope this turns out well. We already have seen how writer Peter Tomasi is touring the nuttier corners of the DCU in this title. So a Planet of Secrets and a Planet of Mystery? I better see some silly version of Cain and Abel! I am sad that the art team of Barberi and Thibert aren't on the issue. Nothing like an inventory story dusted off and put in an expensive format to grab me! I like 'early career' Superman stories. But will I grab this? Bendis and Gleason together again! Don't ask me how this book is going to be shoe-horned into current continuity. I'm coming for the Tim, Cassie, Bart, and Conner. But I'm staying for the Amethyst! I hope beyond hope this is a fun title, bringing some needed light to a suddenly darkening DCU. I mean Jinny Hex? Amazing! 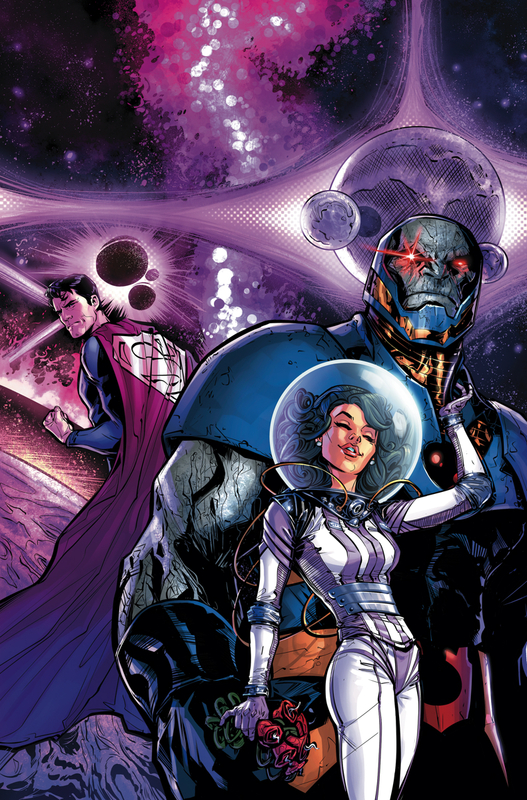 Lois holding a bouquet of Black Mercy and loving on Darkseid? And drawn by Joelle Jones? That alone might nudge me to buy this. But when you add New Gods, Starro, and those creators, I think I am in for this book. This looks like a pretty iconic action figure. Supergirl looks older and more determined here. But I like the design. 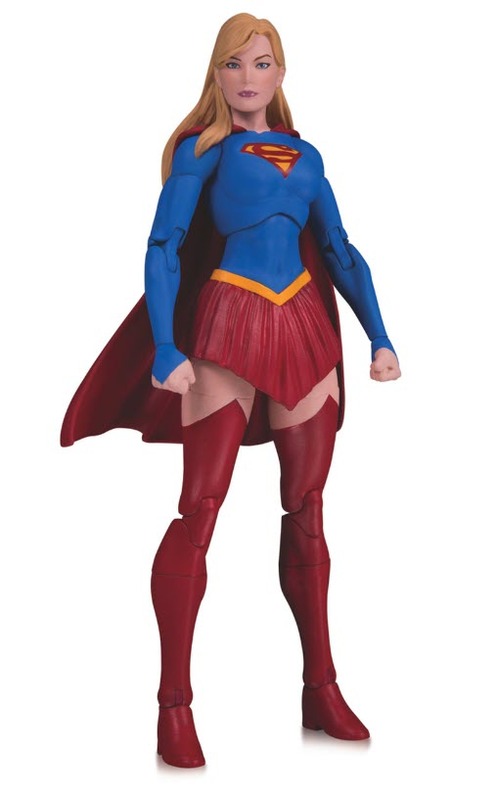 I was wondering if the next Supergirl figure would be boasting the new 'all blue' uniform in the current book but I guess we are still on Rebirth. Start saving your pennies. We have almost a year to squirrel away funds. This 12.5 " statue is based on a piece from renowned artist Stanley “Artgerm” Lau, and features Supergirl dressed in a fan-favorite alternate and more casual take on her costume—her traditional armor-clad blue top and red skirt are replaced with a white crop top and a blue skirt. Carefully detailed in polyresin to match Lau’s beloved take on Kara Zor-El, the statue captures the joyful and heroic elements of the character, perfect for any Supergirl fan. 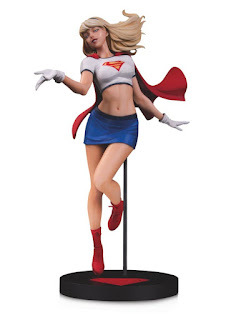 And if that figure wasn't a drain on the funds, we are getting an Artgerm statue based on the cover of Supergirl #19. I do like the Timmverse uniform more and more. I like this statue of Kara blowing a kiss. But will I be able to afford it? I can only hope. Might be the right time to put any holiday money you get towards these goodies! I was a big fan of Wolfman's Action Comics run awhile back, so try and keep me from buying the Spectacular! Harry Hokum, now there's a name. 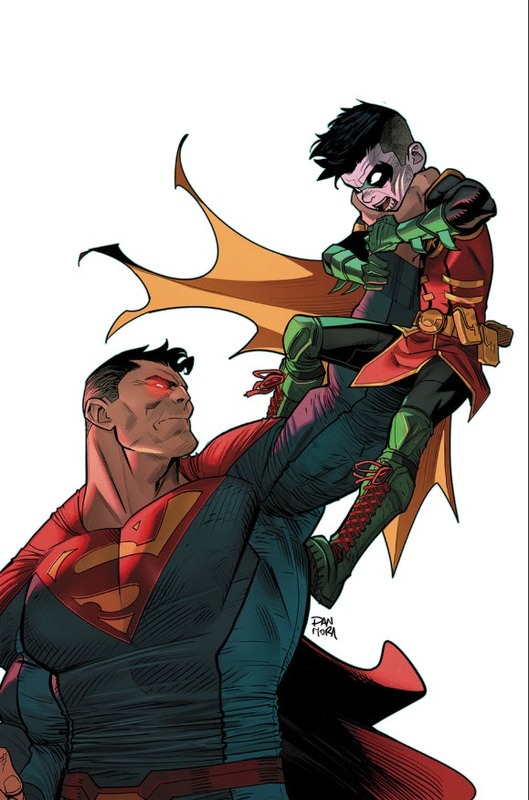 "I can't help but notice that Artgerm is back on the variant cover. Remember everyone, this is a business. If Artgerm on the book lifts the sales by 10K, maybe they should keep him on variants." I hope it is a good issue. "Please please please do not make the leader turn out to be Lana Lang. PLEASE!!" ... I didn't even think it might be Lana. What does it make you think it is Lana? Leaving that aside, I'm somewhat tired of "world-shattering reveals". Only tell me a good story, please. "I keep hoping that some magical Doomday Clock will erase the evil Jor-El nonsense. Make him a robot! Do something!" I agree. I so, SO agree. Evil Zor-El was bad enough, we don't need evil Jor-El either. 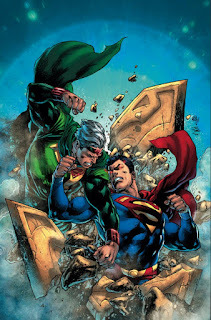 Seeing Superman and his father fighting on a cover makes me cringe. 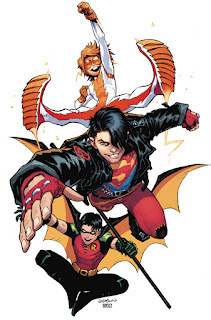 Young Justice returning is interesting, even to someone like me who isn't interested in 90's DC. I wonder how Bendis will pull it off. Those Supergirl statuettes! Awesome, even if the second one is a bit expensive! Over CBR someone thought the second one was a Linda Danvers figure. He should have read the description. Or bought issue 19. "Wasn't that Secret History project advertised as having Kara in it?" It was. I hope she hasn't been dropped. "I remember being confused as to how she could be an oppressed minority. OK, she's a minority, as a Kryptonian..."
Plus, she has saved the world dozens of times, accomplished amazing deeds... and still, in and out of universe she is considered inferior to her cousin by virtually everybody but her cousin, because she is female. You know, it can be a good time to revisit Adventure Comics 411. Sadly, none of these will be able to top the most interesting comic of the month: GRANT MORRISON'S GREEN LANTERN VS GOD!!!! 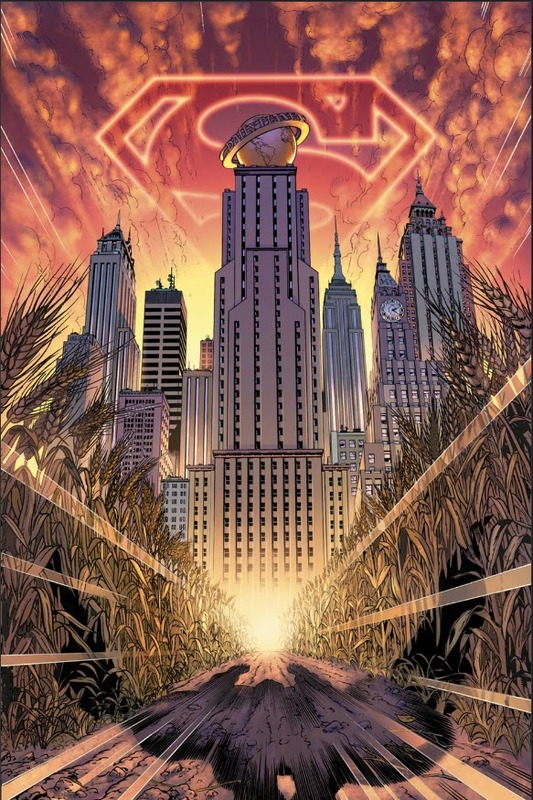 That Superman 100 page spectacular is very pricey but given that it's written by Marv Wolfman, the premise of Clark's early days in Metropolis and the fact it has nothing to do with Bendis' run means I'll probably pick it up despite its more than double price point. Between this, the 3 issues of Detective Comics in January and my regular pull list, January is going to be an expensive month for me. Hopefully Artgerm picks up sales for Supergirl as he did with his variant covers during Rebirth. "Evil Zor-El was bad enough, we don't need evil Jor-El either." Agreed. But what exactly happened to zor el? Is he still on earth? Wasn't he also featured in issue 20 which was Orlando's last? If Artgerm provides the boost, by God I will take it. If it ain't broke don't fix it. 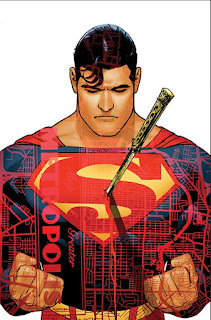 Marv wolfman is a man whose work I won't miss, so the Superman book will be in my bag. 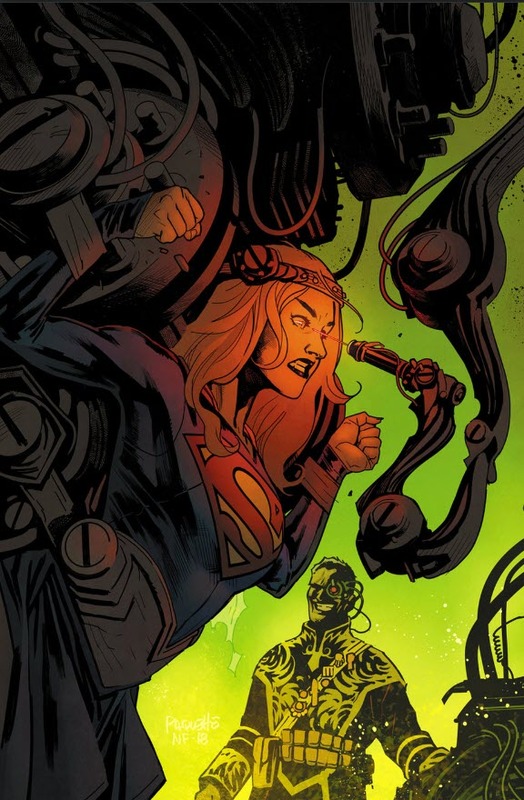 I will also be picking up the other history of the DC universe to see if Supergirl is there or not, I sincerely hope she is because that's the only reason I am getting it. 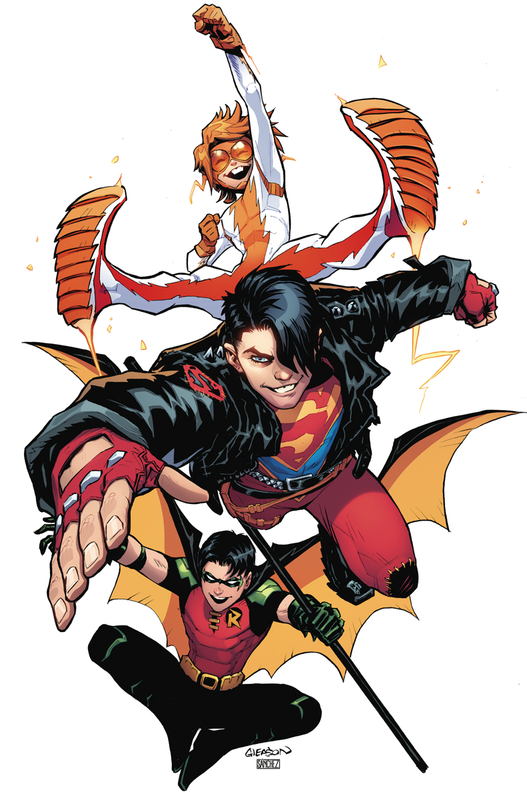 A lot of the January solicitations sound really interesting, I better start saving up! I am all in for Morrison GL. That title is going to rule. I think Supergirl was listed in The Other History but not in this solicit, so wasn’t sure. I suppose the Wolfman story will be bought. But so pricey! Until then she remains a "hot house flower" in the DCEU despite a successful live action TV show, notional movie and her only successful TEAM affiliation which is via the "DC Super Hero Girls" animated shorts. Hmmm - Artgerm's cover for Supergirl #19 isn't "his beloved take on Kara Zor-El" - is it? I presume that's Kara In-Ze of the sister planet Argo from the animated universe. Also, the description reads: "Her traditional armor-clad blue top and red skirt are replaced with a white crop top and a blue skirt." Not much of a tradition. It's true that New 52 had an armored top, but how many people think of New 52 as a traditional or classic look? Rebirth top kind of has some stitching that is only faintly suggestive of armor. As for red skirt - tradition? It went from blue skirt to red shorts to red skirt to blue skirt to largely blue one-piece with a red -- emblem?, finally back to red skirt. And now blue skirt. It took me a long time to figure out that Michael Turner's costume design was NOT that big a departure. You can take the Linda Danvers/animated belly shirt top and switch some colors around to get Supergirl (2004), simply with yellow trim replacing blue trim; short sleeves with white gloves became long sleeves terminating in long gold-trimmed cuffs. Then, both have a short blue skirt. A few artists even gave Linda Danvers' skirt some frills like the Turner skirt had. And the Kara In-Ze/Linda Danvers skirts were just as short as Turner's. Turner was combining elements from various editions. Yup, I winced a bit when I read Kara Zor-El. I would love the statue though. In fact I would already have preordered it if it wasn't for one small detail. I can't deal with the pale blue eyes. It looks like dead fish eyes to me. If I had the slightest aptitude for painting I would have bought it and fixed the eyes myself, but I can't paint at the level of a 3-year old so I might have to sit this one out. I remember Harry Hokum from the original Omega Men series. He was a nasty piece of work and will make a formidable adversary for Supergirl. Good to see ArtGerm back, even if it turns out to be just a one shot. Who knows, maybe it won't be a quick "hello goodbye", and he'll stick around for awhile...although I wish the book was popular enough not to need the extra help. And I like the Amanda Conner variants too. 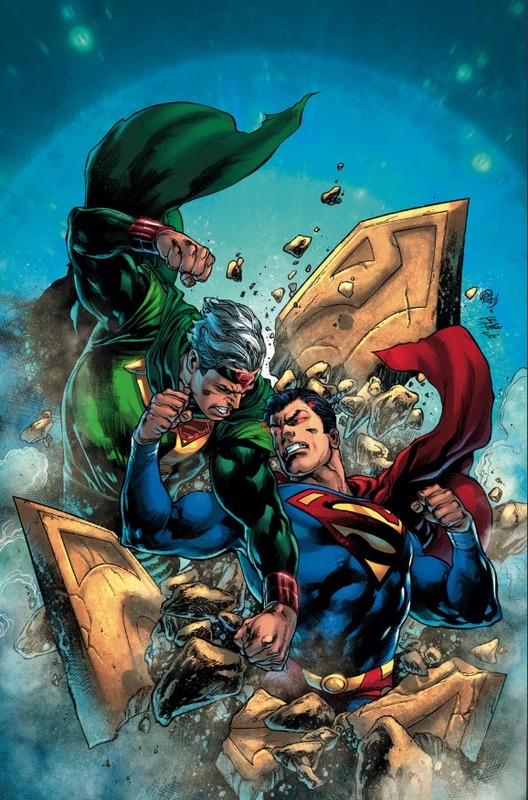 I will welcome the return of Mr. Oz/"Jor-El" if IF that misguided storyline can be resolved once and for all. Jor-El died when Krypton exploded. Period. As for the action figure, it appears that Supergirl changes costumes too often for the merchandising wing to catch up. By the time a figure is designed, approved and manufactured, it's out of date. That brings up a question. Has every costume worn by Supergirl for any length of time (not counting the ones she only wore for an issue or two during Sekowsky's Adventure Comics run) appeared in action figure form? For the original costume there was that Silver Age set with Superboy. The puffy sleeves, hot pants costume had that Justice figure, and there was a Crisis figure for the headband costume. There was an action figure based on the Turner costume, a new 52 figure (with the goo goo googly eyes) and two Rebirth figures. I can't think of one for the Matrix costume. The ArtGerm statue is nice. I read somewhere that the eyes were done pale blue here because that's how they were in the animated cartoons. Supergirl's eyes were also colored light blue in the early Jim Mooney stories. "...She is just not high on any of these writer's priorities such that they are willing to pitch her on a team to the editors." With the TV show providing a greater visibility to the general public, you might think that DC would take advantage of that and do more to promote the comic book to the TV watchers. The old Superman show did it back in the 50s. When Batman came on TV in 1966, suddenly he was here, there and everywhere in the comics. He appeared front and center in Justice League, became a regular in The Brave and the Bold, and even teamed up with Jerry Lewis! I don't think DC should go THAT far with Supergirl, but she SHOULD be a greater presence in the DC Universe.